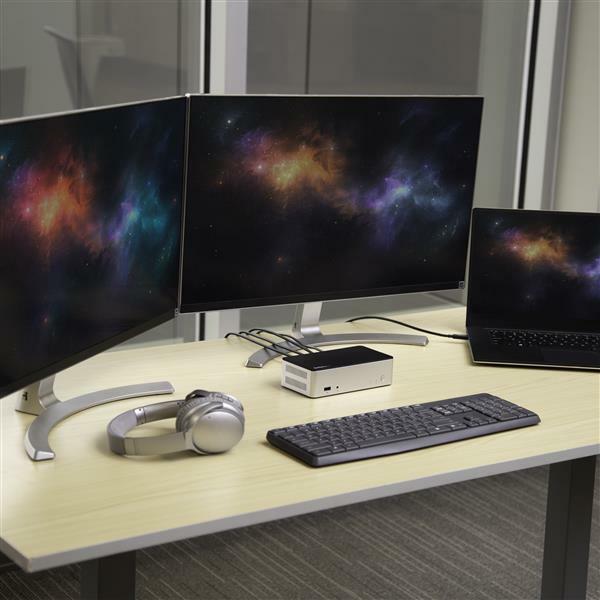 The USB-C dock connects your laptop to two DisplayPort monitors, a wired network and three USB 3.0 devices, while housing a 2.5” HDD or SSD bay, all through a single USB-C cable. This USB C dock allows easy connection of two external displays, with no display driver set up, so you're up and running quickly. 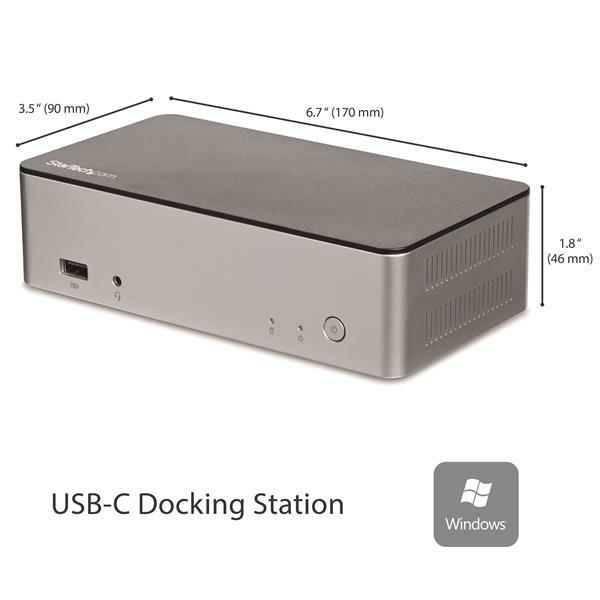 The USB 3.0 Type-C™ docking station provides external storage and backup with a built-in 2.5” SATA SSD/HDD bay. The 2.5" drive bay (SATA I, II, III) is ideal for professionals requiring high-performance external storage, and supports backup functions with Windows Backup or other backup software. 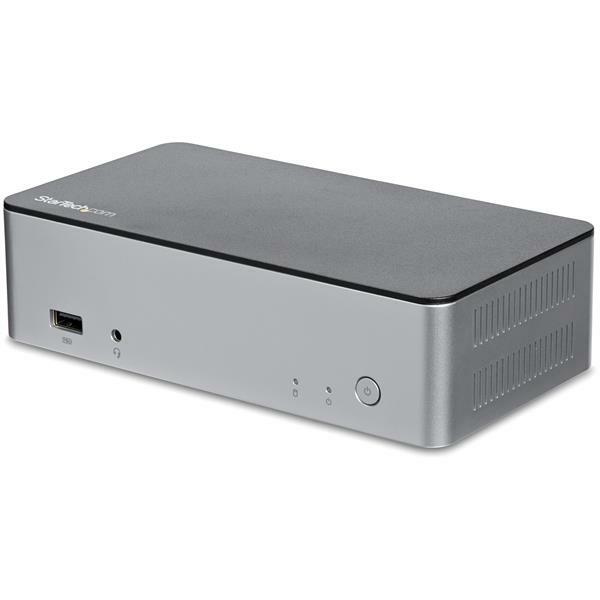 Unlike some USB-C docks that may drop to USB 2.0 and limit Ethernet performance, this USB-C dock offers full USB 3.0 and network bandwidth. This provides faster data transfer speeds for USB 3.0 peripherals and supports true Gigabit Ethernet throughput. Connect your USB devices with three USB 3.0 ports (including one fast-charge port). 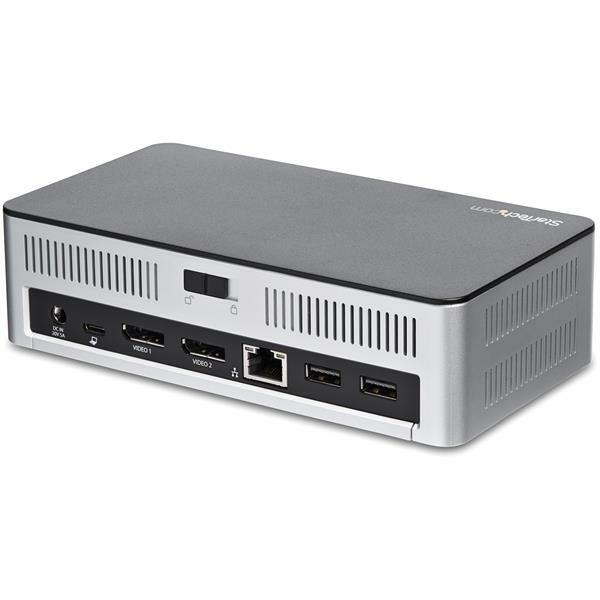 The port replicator also provides a Gigabit Ethernet port (with PXE Boot) and 3.5 mm headset port. 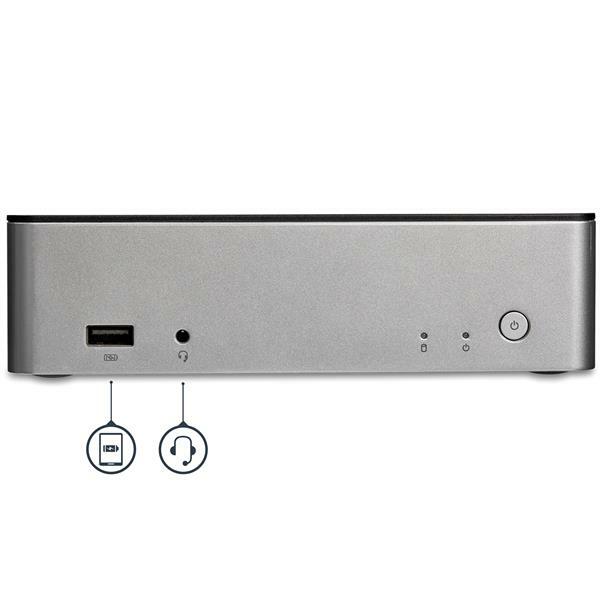 The USB-C docking station with Power Delivery (up to 60W) supports charging through the included 100W power adapter. 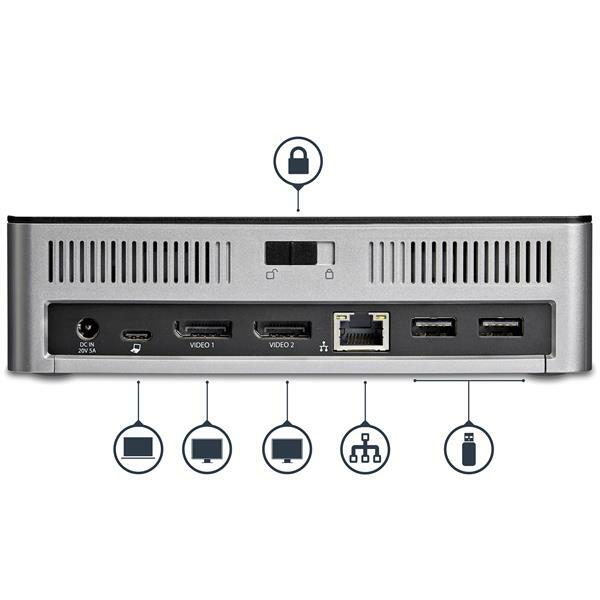 MST30C2HDPPD is backed by a StarTech.com 3-year warranty and free lifetime technical support. 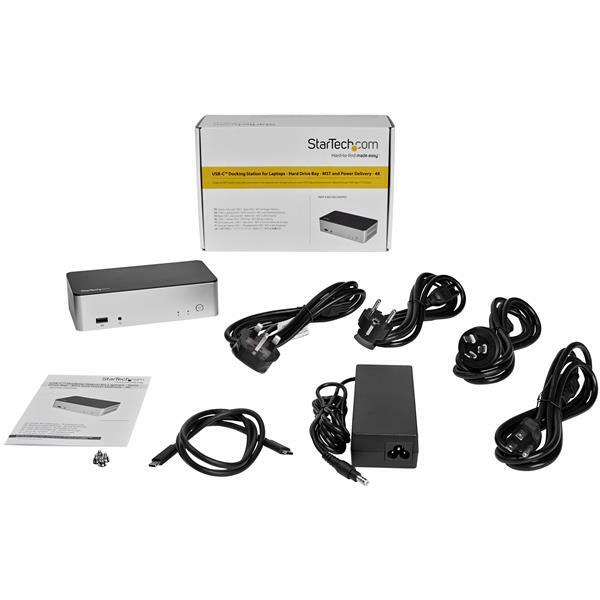 (4 stars) Works with MacBook PRO TB! Seems to pretty stable with MBP as long you only need a single external monitor since it doesn't use displayLink drivers. The charging capability is decent and adding a Firecuda SSHD drive performances pretty well with backing up data. Overall, without having to deal with 3+ dongles, I'm pretty happy with this item. It would be perfect if it has DisplayLink Driver! The reason I was excited about this product was that I could set it up on my dad's desk and not have to worry about him forgetting to backup his laptop by not hooking up an external HDD. This dock does exactly its job and that is reducing the peripherals that connect to your laptop and that are sitting out on your desk. When he connects the dock to use his dual monitors, the storage is automatically presented to him and the backup jobs run without issue. I was able to pop in a cheap 1TB HDD and know that when the day comes that his laptop dies, we'll have a good backup of his data. Aside from that though, this dock has all the ports you'd want to find in a dock. This is confirmed working on an HP Pro Book and a Dell XPS 13. I received this product in exchange for an unbiased review. The build is solid, and the size is perfect, and frankly it LOOKS good. Zero complaints here! Connect it, and things just worked! I was using the newer Startech TB3 dock for my touchbar Macbook, but... In testing this, I actually like this better because I can use it with my Dell too. Ports are ports, so I want to focus on the power delivery and.. that drive bay! With the smaller internal storage in the Macbook and the Dell (built-in :( ) I am always connecting an external drive with the laptops, but now, I connect the dock and I have power, monitors, network, external keyboard and mouse, AND extra local storage. Can't wait for my new test Chromebook to arrive (it's USB-C as well!). 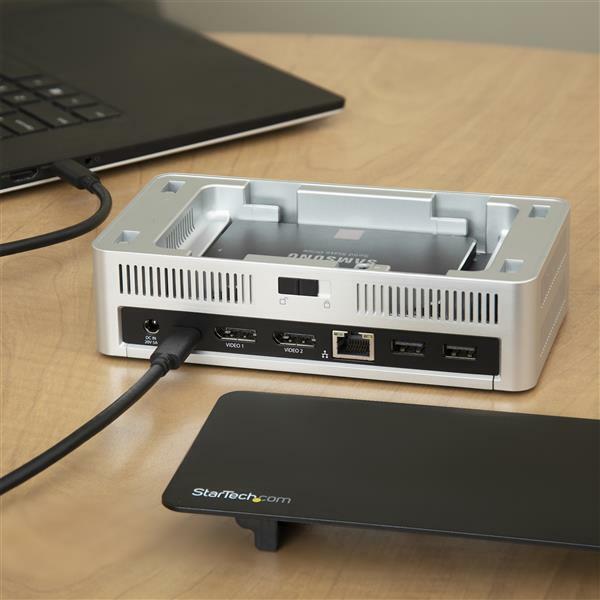 I would LOVE too see Startech either start to standardize the form factor to make stacking devices easier, design a common connection/stacking interface, or make some kind of desktop "mini-rack"... I am using this with the dual DP KVM, and a USB 3/USB-C hub, so it's kind of messy with the cables, so I'm building a custom box to mount it all together flush/neat. :) Haven't had a chance to test it with Linux yet though. But I will!